Discovering new music is always a thrill. It is like discovering a new flavor in food, a new planet in space, and heck, some may say that it is like having a new baby! It is no surprise that Spotify and others are working around the clock to come up with magical algorithms that try to predict what kind of music we like and what we would love to hear next. But does music discovery is really a function of how good a magical algorithm is? Well… I must say that it would have been nice if some lines of code could bring you a new born child. Does music discovery is really a function of how good a magical algorithm is? Well… I must say that it would have been nice if some lines of code could bring you a new born child. So what is music discovery? let’s try to science our way to the answer. You sir, love music genre\band\song X. They want you to discover and then like music genre\band\song Y. Wait, discover and also like? These are two different things. SureI can discover new music, easily. Let me just turn my radio on, or let YouTube and Spotify randomly find some tunes for me. So music discovery is already a problem solved, right? Wrong! Since discovering new music is also tied to stepping over the challenging barrier of actually liking this new thing coming into my ears! Most of these algorithms are based on what you hearing now and previously. So as a guy that into X, you probably also listened to 2X, X/3 and the square root of X. Cool. But with these variables, there is no way to reach that likable Y. Science is great, but we’re dealing with music. One of those emotion-related things in life. The only way to analyze and figure out emotions is with the help of emotional line of codes – AKA human beings. So humans are the best algorithms to help you discover (and actually like) new music. My name is Bond, James Bond. I am the guy who sits next to you. Your X music is nice, but I’m more into Y music. I even have a T-shirt of Y^2 band! They are really awesome. Wait, you’ve never heard of them? Have a sit, I will play my favorite Y^2’s for you. Well? I know that Y is a bit odd. After all, it’s not a mainstream genre. You starting to get it huh? not bad, actually. Let’s check out their other album. Fast forward >> congratulations mister X, now you also like Y. And this is our guideline on BeatSense. Prepare to discover, prepare to have new babies, daddy. BeatSense is a real-time collaborative music platform. You enter a room (a playlist), while there are other people in that room, listening to the same music at the same time as you are. Yes, just as if you physically were in the same room. 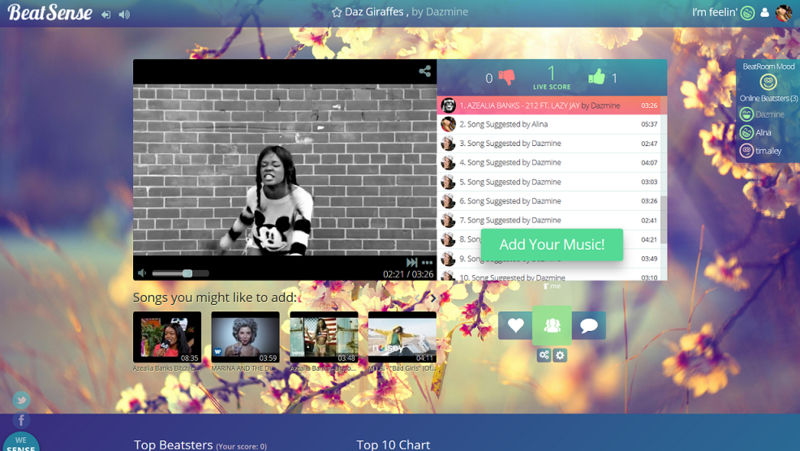 Everyone can populate the playlist in real-time. Everyone can give feedback to each other in many ways in order to shape the music that is being played. Here, the content is influenced by the people. Your friends, your co-workers, your family, or any other music lovers around the world. You can be sure that good music will come to you in many (human) ways. Prepare to discover, prepare to have new babies, daddy. BeatSense.com, party one. Experience music. In any case, I like BeatSense. I use it as a radio now and it mostly plays music I like and never heard before.